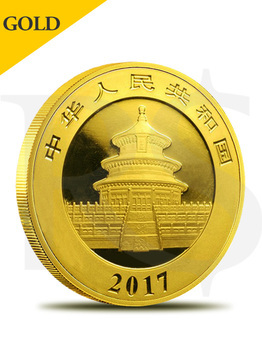 This fabulous 2017 30 gram Chinese Gold Panda 500 Yuan BU Coin is the newest issue in the famous Chinese Gold Panda Program. Exceptionally minted from 30 gr. 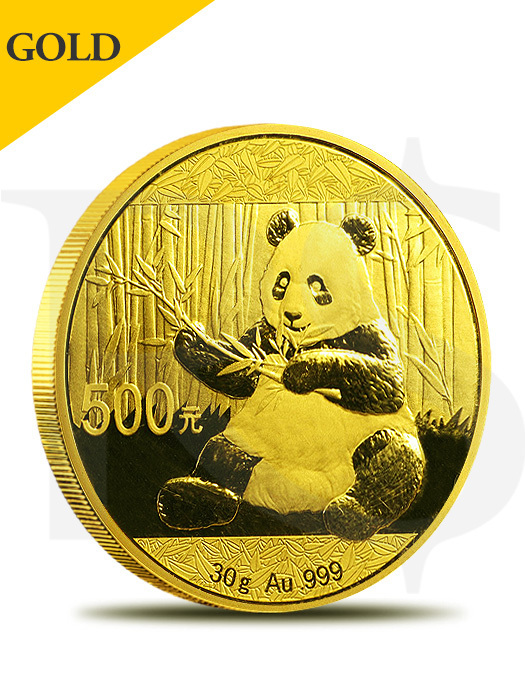 of .999 fine gold, this wonderful coin showcases the latest depiction of a cute and playful panda eating a large bamboo branch while sitting down on a bamboo background. The People’s Republic of China issued the first Chinese Gold Panda coin in 1982, made from .999 fine gold. The coin was available in four sizes of 1/10 oz., ¼ oz., ½ oz. and 1 oz. In 1983, the mint authorized another size, the 1/20 oz., and some years also included the 5 oz. and 12 oz. weights. Each year the reverse design of the coin features a new panda image. Just like Chinese Silver Pandas, the only exceptions are the 2001 and 2002 releases that share the same reverse design. These astounding coins are produced at the Shanghai, Shenyang and Shenzhen Mints, yet they don’t bare any mint marks. However, the coin’s issued by different mints can be distinguished by minor design differences. Starting with 2016, the Gold Chinese Pandas are issued in metric system weights, being available in 1 gr., 3 gr., 8 gr., 15 gr. and 30 gr. options, for bullion coins, and 50 gr., 100 gr., 150 gr. and 1 kilo proof gold coins.This outstanding 2017 30 gram Chinese Gold Panda 500 Yuan BU Coin, with a limited mintage of just 700,000 coins, is an exceptional gift for any collector or investors fond of this sensational series. Consists of 30 grams (.9645 oz.) of .999 fine gold. Just 700,000 coins issued by the mint. Minted with a denomination of ¥500 Yuan. Weight and purity assured by the People’s Bank of China. 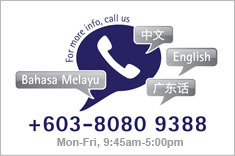 Legal tender coin in China and IRA-Eligible. Coin sealed in mint packaging. Obverse: Displays the renowned Hall of Prayer for Abundant Harvests of the Temple of Heaven from Beijing. This impressive image is encircled by the inscription “People’s Republic of China” written with Chinese characters and the year of issue of the coin. Reverse: Features the newest image of the beloved panda bear, engraved as sitting down on a bamboo background and eating a bamboo branch. The image of the adorable panda bear is surrounded by the coin’s face value, weight, and purity.